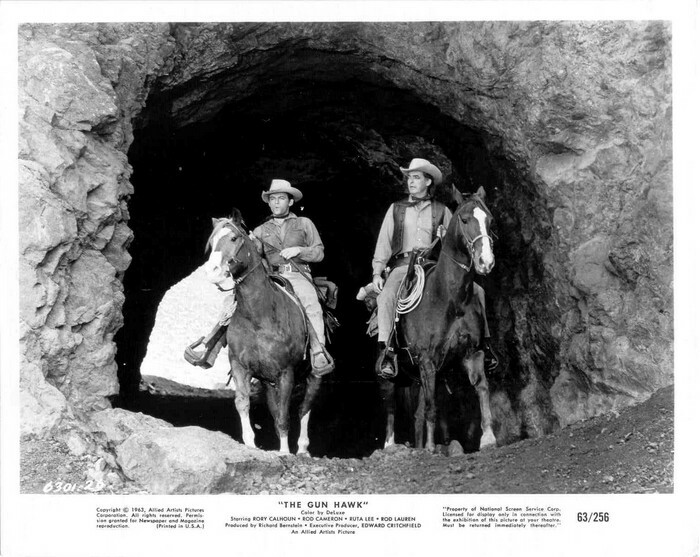 This is a late western in the careers of Rory Calhoun and Rod Cameron, and the last movie for director Edward Ludwig (who made such John Wayne non-westerns as Big Jim McLain, Wake of the Red Witch and The Fighting Seabees). The title refers to the mysterious figure who runs the haven of Sanctuary on the Mexican border, enforcing his rules with his gun. 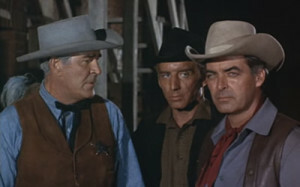 Blaine Madden (Rory Calhoun), not bad with a gun himself, rides into Baxter, the town where he grew up, in time to meet and help young footloose gunman Reb Roan (Rod Lauren). Sheriff Ben Corey (Rod Cameron, with lots of gray paint in his hair) liked Madden when he was growing up and once offered him a job as his deputy. He didn’t take it, but his jealous childhood friend Mitch (Morgan Woodward) did, and he still resents Madden. Madden tells Corey he’s not staying in town but is headed to Sanctuary. 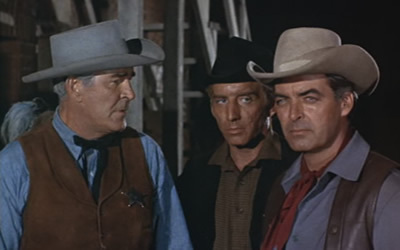 Sheriff Ben Corey (Rod Cameron), Deputy Mitch (Morgan Woodward) and Blaine Madden (Rory Calhoun) all see trouble coming but differ in their responses. In the local saloon, after Madden helps Roan in a fight with the Sully brothers, those brothers start picking on the town drunk (long-time character actor John Litel, who had often played ministers and even Gen. Phil Sheridan). Finally, they shoot him, not realizing that he’s Madden’s father. Madden leaves town, saying he’s not going in pursuit of them, but he finds them before Corey does. Corey rides up, sees Madden standing over the two dead Sullys and tries to arrest him. Madden rides away, gambling that Corey will not shoot him in the back, but he does, winging him. Aimless young drifter Reb Roan finds Madden having collapsed from his wound and does what he can to doctor it. It’s in Madden’s right arm (his gun arm), and it obviously impairs Madden’s ability to use his gun. As the two of them ride into Sanctuary, Madden is greeted as “El Gavilan,” Spanish for “the hawk”—he is the mysterious figure who presides over Sanctuary. His first action is to run out Johnny Flanders (veteran screen heavy Robert Wilke), who has violated Sanctuary’s rules about not using guns. He accomplishes this not with guns but (not very convincingly for some one with a badly wounded right arm) with his fists. Roan (Rod Lauren) and Madden (Rory Calhoun) ride into Sanctuary. [Spoilers follow.] Ben Corey rides into Sanctuary and takes Madden into custody, but the residents of the hamlet prevent him from riding out with El Gavilan. Mitch tries unsuccessfully to raise a posse in a neighboring town and wants to just shoot Madden down. Corey takes back his badge. Meanwhile, in Sanctuary Madden’s romantic interest Marleen (Ruta Lee) spends the night with him, and in the morning he forces Roan into a gun fight. Roan is wounded but Madden (who was dying from his wound) is dead—a death the way he wanted it. Marleen then explains to Roan that, having violated the rules of Sanctuary, he must now leave. The ending is not terribly satisfying, and the rationale for Reb having to leave not all that convincing now that Madden is dead. There are at least two alternate endings that would have worked better: (1) Instead of Madden dying, he and Roan stage the final gunfight, but it is just that—staged, for Corey to witness from his perch above the town. When he sees Madden’s apparent death, he gives up the chase, and Madden and the inhabitants of Sanctuary live happily ever after in their remote location. Or better, (2) if Madden has to die, it plays out as in the movie, but with his last words the dying Madden passes to Roan the mantle of El Gavilan, and Roan becomes the protector of Sanctuary in the place of his mentor. And it’s never really explained why the fatherly Corey actually did shoot Madden in the back, although theoretically just wounding him. The result in the film is probably more true to the state of 19th-century medicine on the trail than if Madden had survived. A last night for Madden (Rory Calhoun) and Marleen (Ruta Lee). Experienced hands Calhoun and Cameron are fine in this low-budget effort, although Calhoun spends too much time just looking pained, either from his wound or the situation around him. Lauren and Ruta Lee are not impressive. 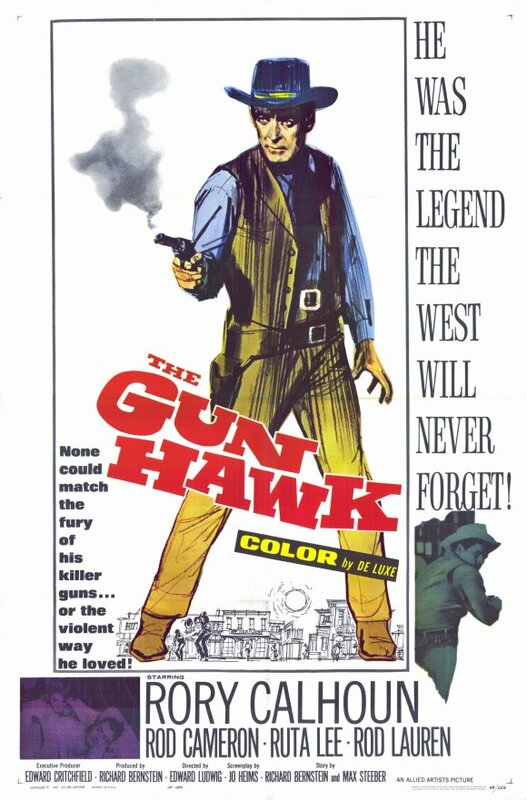 This is not among Calhoun’s very best efforts; those would probably be Dawn at Socorro (1954) and Apache Territory (1958), both with better writing. But it does pull us in with interesting characters, good world-weary acting from Calhoun and with its twist on familiar situations up to a point, until things fall apart at the end. 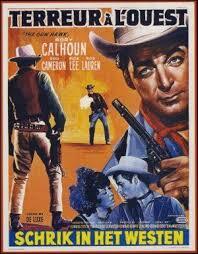 Rory Calhoun fans will want to watch it anyway. In color, at 92 minutes. For another tale of a haven for outlaws in the Southwest, see the more famous Rancho Notorious (1952) by director Fritz Lang, with the establishment presided over by Marlene Dietrich. There is a string of westerns about gunmen with physical impairments, the best-known of which is El Dorado (1966), in which John Wayne is the afflicted gunslinger. This entry was posted in Westerns Worth Watching and tagged Aging Gunfighter, Manhunts, Rory Calhoun on June 11, 2015 by Nicholas Chennault.